Great news for car buyers everywhere: Autotrader.com is finally switching from Carfax for their vehicle history report provider to Autocheck. 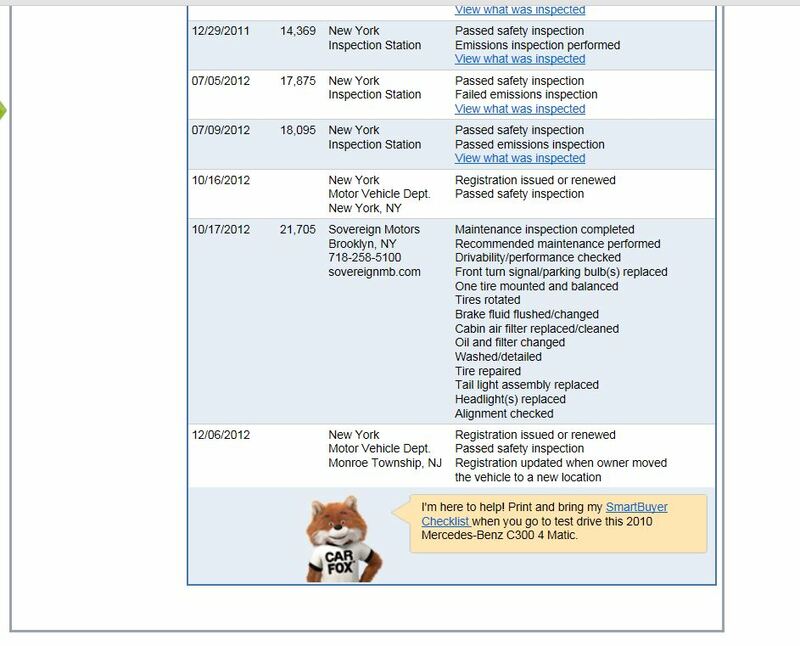 There have been many studies and comparisons posted online to point out the differences between these two reports, so I won’t bore you with a long story about ALL the differences between Carfax and Autocheck…but I will point out the most important one: Autocheck has exclusive access to information that comes from automobile auctions. This means that any vehicle that has passed through an auction (more than 80% of all vehicles will roll through an auction block at some point in their life) and had an announcement for Frame Damage, Salvage History, odometer rollback, etc will have this information reported on the Autocheck report. This is exclusive info that Carfax will not have. Here’s an example of why this information is so important: Let me start by saying that Carfax does a great job. They are definitely a great source of information that we use everyday and we suggest that every customer use Carfax and run a report for any vehicle they’re interested in. But…there are items that Carfax misses, that’s why you can’t buy a car based on using Carfax alone. It’s a good start, but not the complete answer to the vehicle’s history. Here’s a case study that I put together this morning as an example of where Autocheck’s exclusive access to auction information is worth it’s weight in gold. 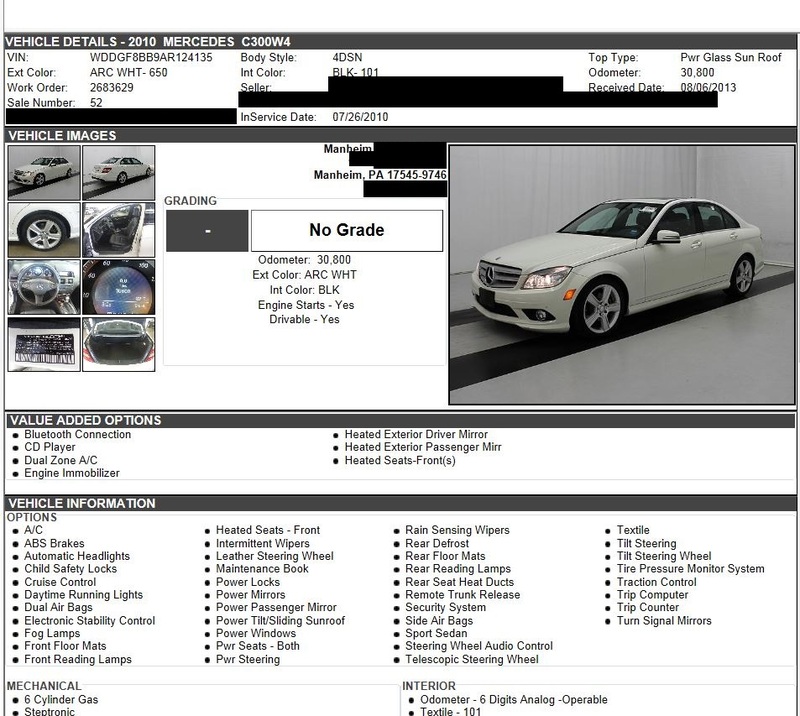 The two screen shots below are an actual condition report for a Mercedes-Benz 2010 C300 Sedan being sold at an auction on 8-30-2013. This car is absolutely disgusting and was clearly banged into everything the previous owner could run it into. It is truely a real life bumper car. 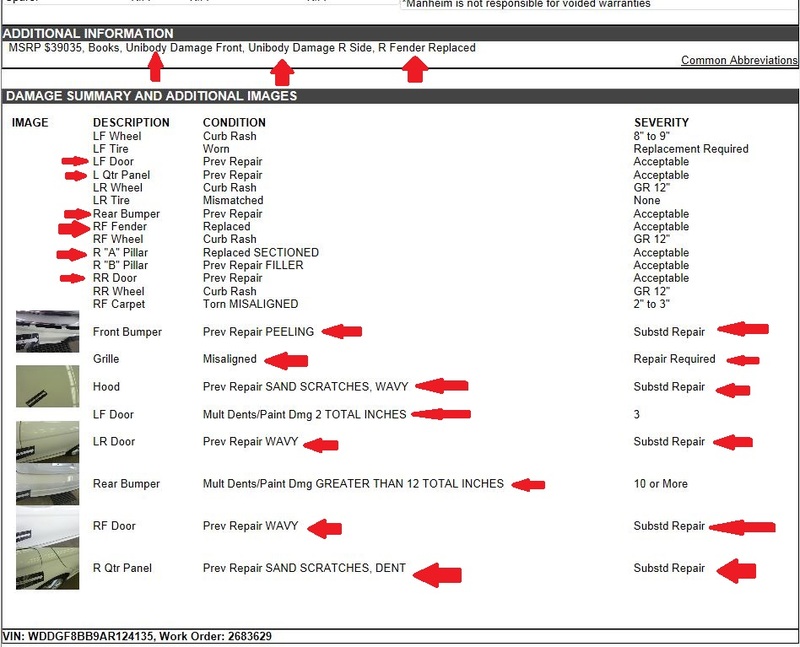 Take a look at the red arrows on the second page that shows the actual condition of the vehicle today. You will find that Mercedes-Benz is announcing this vehicle as having “Unibody Damage Front, Unibody Damage R Side, R Fender Replaced” Basically, frame damaged. Below that announcement, they make clear that this vehicle is a piece of junk. There are many disclosures about previous paintwork, previous bodywork, a replaced fender, a replaced A pillar and previous wavy bodywork all over. 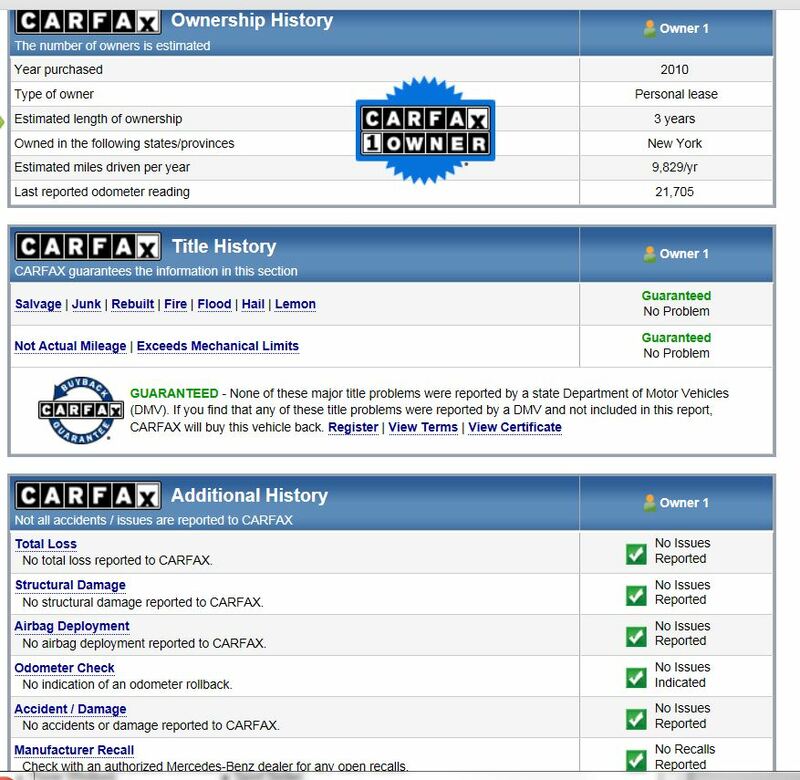 The three images below are screenshots from a Carfax report that I ran today. This report is 100% clean. This is a case where the auction will announce this information to Autocheck and the Autocheck history report will be updated with this Frame / Unibody Damage history. 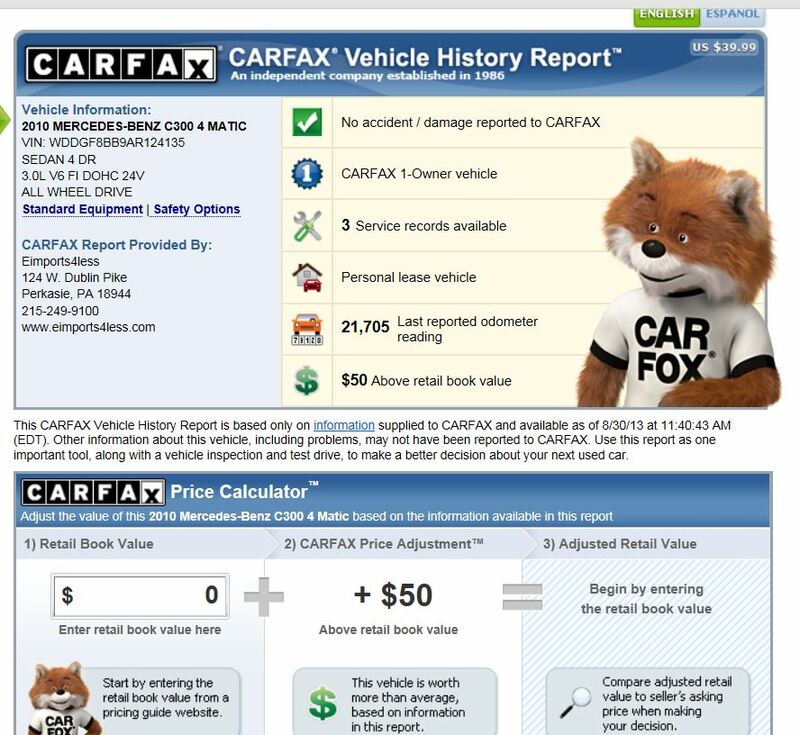 Carfax does not have access to this info, so their report will continue to tell a nice story about this junk car. 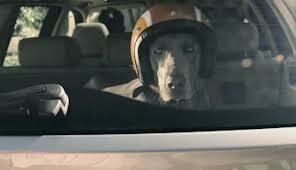 To be fair, Carfax does catch an awful lot and like I said before…you should always check Carfax reports. They are valuable and worth every penny that you pay for them. What we’re saying here is that you should check both. 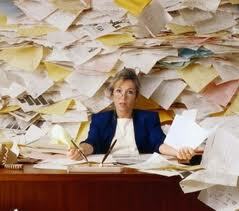 Do not rely on one single report. Auto Mechanics taking customers for a ride ?? We’ve all heard stories about mechanics “taking a customer for a ride”. Like any other profession, there are a lot of very honest mechanics out there…and a few bad apples that are the source of these stories. I just read an article in this month’s MONEY Magazine on this subject that had some good stats, so I decided to share the info. This is why it’s important to be prepared and educated when dealing with mechanic shops and dealership service departments. MONEY magazine goes on to recommend automd.com/repaircost to check out the common costs for repairs. eimports4Less has always recommended Ask Patty to our customers when it comes to comparing prices and getting the straight answers about repairs. Check out Askpatty.com for info. 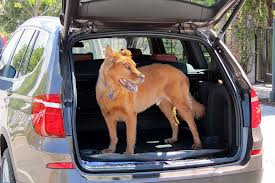 The BMW X3 was recently named the most “dog friendly” SUV. Owners and professional test drivers loved the X3 for many reasons, ranging from low step in height in the cargo area, to the usability of the cargo area pet net. 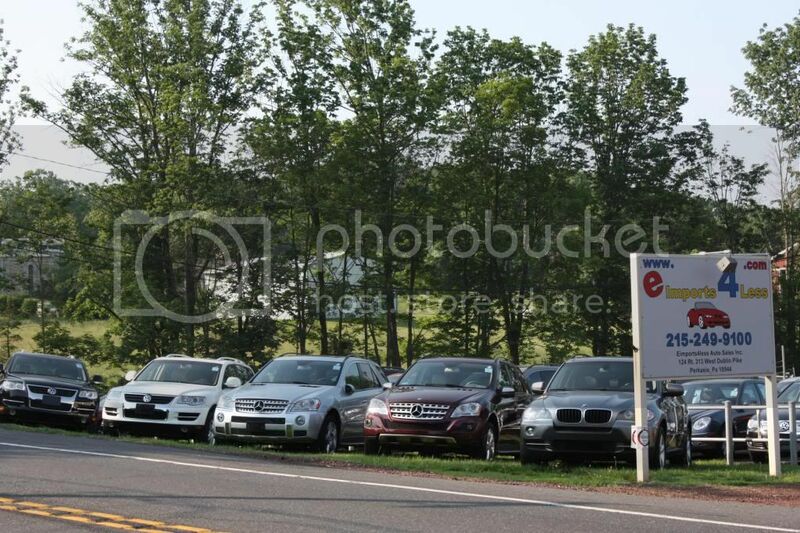 We’ve noted some of the same comments about the X3 when we polled some eimports4Less customers also. The lower ride height is great for the pets and even easier for the driver to get in and out and load a pet carrier when necessary. We definitely recommend checking out the X3 is you’re in the market for a small to mid size SUV that handles well, brakes well, performs well and has great usability for your pets. 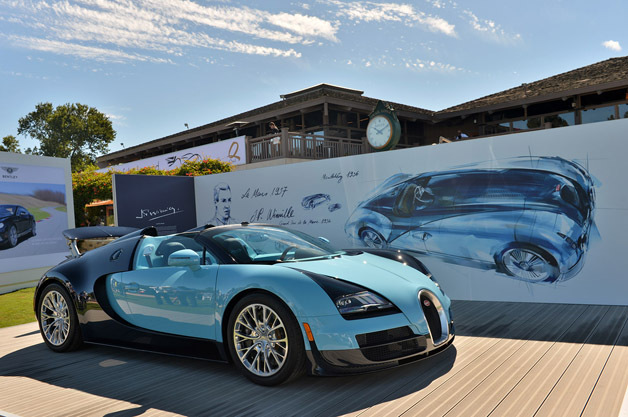 Bugatti unveiled the first of five special “Legends” model Veyrons this week at the Pebble Beach show. The cars are being produced to pay tribute to important people in the French manufacturer’s pre-war history. This first car is dedicated to Jean-Pierre Wimille, their longest serving test driver, and is painted in the same color scheme that Wimille’s own race car was (a 1939 Bugatti Type 57C). 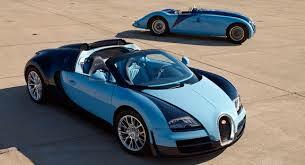 The image below is the new car at Pebble Beach. Stay tuned for pics and info on the other four Veyrons when they become available. I know this sounds impossible: An “Easy” car buying experience? I’ve read dozens of stories online and heard hundreds of stories from customers telling me about what a horrible experience they had the last time they bought a car. Don’t walk into a car dealership without knowing what brand of vehicle you’re interested in buying and preferably what exact model you think fits your needs. Over 90% of all used vehicle shopping starts online because there is an abundance of information available for you for free online…so get with the program and get online. All the information online is FREE and you can learn a lot about vehicles on your own schedule, in the comfort of your home. 2. Find a good fit online and find that vehicle in stock. Find yourself a make and model vehicle that fits your needs. Keep in mind all of your necessities: How many seats, 2 wheel drive or all wheel drive, SUV or convertible, etc. Narrow down your search online and then find that vehicle at a dealership. Look online at sites like Autotrader, Cars.com and ebay Motors to find vehicles that are actually still for sale, not just an old catalogued ad out in cyberspace. It is also VERY IMPORTANT to call the dealership first to make sure the vehicle is still available and on site for you to view if you choose to come in. Once you’ve tracked down a few similar vehicles that may fit the bill for you, start comparing those vehicles and listing out the important information, the pros and cons for each vehicle. Since every used vehicle is essentially a thumb print, one of a kind, make sure you pay attention to miles, options, colors and probably most importantly the vehicle’s history. 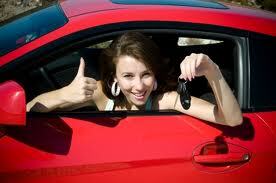 ALWAYS check the Carfax report -AND- the Autocheck History Report. These reports are different and they do get information from difference sources, so it is important to make the investment and check both. 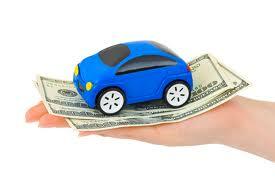 Compare apples to apples and you’ll get a good idea of what the fair price is for the vehicle. This will help you be prepared for price talks. 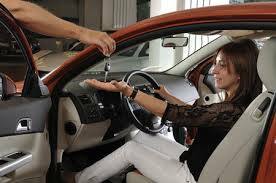 Many dealerships have moved to the “NO Haggle” style of selling vehicles since it’s more pleasurable for the buyer, so be prepared to pay the advertised price at some dealers. So long as it’s a fair price, there’s no harm in this. Just do your pricing research up front so you know what a fair price is. Be prepared to be successful. There’s no sense in going to a car dealership ill prepared and making multiple trips to finally get the purchase done. Be productive with your time and you’ll have a happier experience. Grab a few current paystubs, your current insurance card, your driver’s license and your insurance agent’s name. Do you need to trade-in a vehicle? If so, get your title. No title? Bring your payoff information with you, the dealer will need that. 5. Go get your car ! You’ve found a model that you like, narrowed it down to a specific vehicle, found that vehicle at a dealership, researched the vehicle history, researched pricing, organized your paperwork and called the dealership to check availability. Now you’re ready to make your first trip to the dealership. You’ve set yourself up for success and so long as the vehicle looks, runs and smells like you expected…you’ve got yourself a car! The staff here at eimports4Less has scoured the web and compiled a list of the top ten things you should know about driving your convertible this season. Now that the “Dog Days of Summer” are over and you can actually put the convertible top down and drive all day and all night, here are some tips to make the drive enjoyable at all times. 1. Use sun block at all times. You can burn even on cloudy days. 2. Put anything lighter than a paperweight either in the trunk of in the glove box. Anything that’s not stored is going to fly away on you. 3. Hats will almost always blow away on the highway. Save the hats for around town, low speed cruises. 4. Keep the interior clean. Dust and dirt from your carpets will fly around at higher speeds and can get into your eyes. 5. Set-up a soundtrack or mix of music before you head out. Nothing compliments a relaxing top-down cruise like your favorite tunes. 6. Practice rapid “top up” drills if you have a manual convertible top. This will help prepare you for unexpected rain drops. 7. Don’t flick cigarettes while driving. If you must smoke while driving, always wait until you come to a stop before flicking out the butts. They could land in the back seat and cause a problem. 8. Don’t forget your sun glasses. You’ll need them ! 9. Keep your dog restrained. 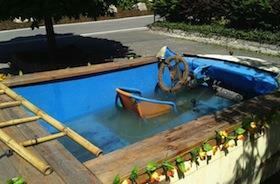 Fido might abandon ship at any point if you don’t. 10. 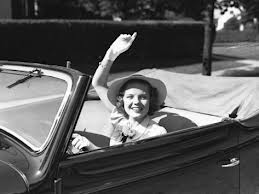 Always, always, always tip your cap, wave or wink at other convertible drivers. This let’s them know that you’re part of the club. They’ll know that you know what they know and they know what you know, etc. You’ll both feel better about being part of the club. 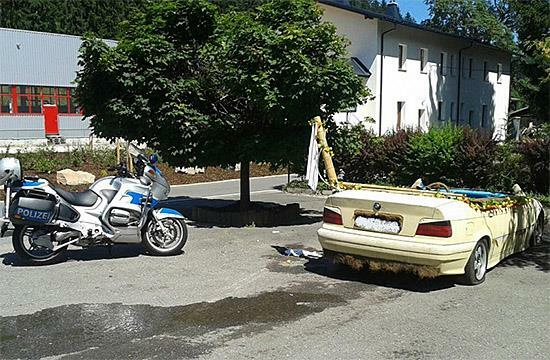 German police were surprised recently when they pulled this BMW over for driving without proper registration. The owner recently stripped out the interior, filled the holes and filled it with approx. 500 gallons of water. The driver was drunk, had no insurance and the car was not registered. There were also three passengers in swim suits hanging out at the pool when it was pulled over.